Stephen Curry heats up for 38 points with 6 assists as the Warriors surge past the Cavaliers in Game 4 of the Finals. Stephen Curry gets hit as he sinks the corner 3-pointer. The Golden State Warriors gather at center court to receive their Western Conference Championship Trophy. Anderson Varejao makes the nice pass to Draymond Green who slips backdoor and finishes through contact. Stephen Curry finds Anderson Varejao for the layup. J.J. Barea scores 26 points and hands out six assists to lead the Mavericks past the Knicks, 91-89. Klay Thompson and Stephen Curry combine for 73 total points as the Warriors beat the Mavericks 128-120. Marcus Morris scores 24 points and Kentavious Caldwell-Pope adds 23 to lead the Pistons past the visiting Kings, 115-108. Take a gander at the Top 10 Plays from Thursday's action in the NBA. Stephen Curry can also play amongst the trees as he takes the pass from Anderson Varejao, drives, draws the foul and throws in the reverse off the glass. 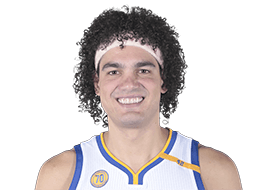 Anderson Varejao hustles back on defense and gets the clean chase down block from behind. Cleveland's Anderson Varejao and Matthew Dellavedova arrive for the opening game of the season versus Chicago. Paul George had 17 points and 8 rebounds as he led the Pacers beat Cleveland 107-85. Jeff Teague scores 17 points as the Hawks win a nail-biter in Cincinnati, defeating the Cavs 98-96. LeBron James' 31 points and 11 boards helped the Cavaliers hold off the Celtics 103-95 and make the series 3-0. Kevin Love scores 20 points in his first game against Minnesota, Kyrie Irving adds 29 and the Cavaliers pull away in the second half for a 125-104 victory over the Timberwolves. LeBron James has 25 points and 11 assists, Dion Waiters adds 21 and the Cavaliers beat the Grizzlies 105-91. LeBron James dumps the dime between the double team to Anderson Varejao for two. LeBron James scores 22 points, Mike Miller hits 7 of 8 from deep in his first start ofr 21 points, as the Cavaliers top the Nets 95-91. Shelvin Mack scores a career-high 24 points with a perfect 6 for 6 from deep to lead the Hawks in a Cavaliers rout 127-98. 2013-14 SEASON: In 65 games (29 starts), averaged 8.4 points, 9.7 rebounds, 2.2 assists and 1.1 steals in 27.7 minutes per game… Recorded his 16th double-double of the season with 11 points on 5-8 (.625) shooting and a team-high 12 rebounds in 21 minutes off the bench against Detroit on Apr. 9… Tallied eight points and a game-high 13 rebounds in 29 minutes at Brooklyn on Mar. 28… Notched his 15th double-double of the year with 12 points on 5-9 (.556) shooting and a game-high 16 rebounds in 31 minutes at Detroit on Mar. 26… Double-Doubles–16 on the season, 88 in career; DNP-CD’s –1 on the season; DND’S–2 on the season; NWT’S–3 on the season; Injury List – Missed 3 games from Jan. 28–Feb. 1 due to a left knee contusion and hyperextension; Missed 12 games from Feb. 11-Mar. 7 due to a sore back; Missed 1 game on April 2 due to a right AC joint sprain; Inactive List–11 on the season. 2012-13: Played in 25 games (all starts)…averaged 14.1 points on .478 shooting, 14.4 rebounds (5.5 offensive), 3.4 assists and 1.5 steals in 36.0 minutes per game…set career highs in points per game, rebounds per game, assists per game, steals per game and double-doubles (16) at the time of his injury on Dec. 18…prior to his injury, he led all qualifying NBA players in rebounds per game, offensive rebounds per game (5.5) and defensive rebounds per game (8.9) and was tied for second in double-doubles…recorded a double-double in a career-high 10 straight games from Nov. 18 – Dec. 5, becoming the third player in Cavs history to post 10 straight double-doubles in a single season, joining Kenny Carr (10 straight in 1980-81) and Elmore Smith (11 straight in 1977-78)… recorded 15 games of 15 rebounds-or-more and two games of at least 20 reboundsor- more…scored at least 10 points and grabbed 15 or more rebounds, including five or more off the offensive glass, in 10 straight games from Nov. 18 – Dec. 5…the only other NBA player to score 10 points and grab at least 15 rebounds with five offensive boards in 10 straight games (since the league began recording offensive rebounds in the 1973-74 season) was Moses Malone, who had a 12-game streak for the 1978-79 Rockets (Elias)…became the first Cavs player in franchise history to have 10 straight games of at least 15 rebounds (Nov. 18 – Dec. 5) and the first NBA player to do so since Kevin Love (10 games in November/December 2010)…in an Opening Night win over Washington on Oct. 30, recorded nine points, a career-high 23 rebounds (12 offensive) and nine assists to become the second player in NBA history to tally those numbers in a team’s first game (Wilt Chamberlain on Oct. 18, 1967) and first player to put up those numbers in any regular season game since March 20, 1987 (Charles Barkley)…scored a career-high 35 points on 16-21 (.762) shooting and added 18 rebounds, three assists and two steals in 37 minutes, becoming the first player to tally at least 35 points, 18 rebounds and shoot .750 from the field since Shaquille O’Neal on March 21, 2003 (48 points, 20 rebounds, .792 FG%)…posted 15 points on 7-11 (.636) shooting, 22 rebounds, three assists, two steals and one block in 37 minutes at Memphis on Nov. 26…had back-to-back games with 20 points, 18 rebounds and three assists on Nov. 27 versus Phoenix and Nov. 30 at Atlanta…finished the month of November with 204 rebounds in 14 games, the second-most rebounds in a calendar month for any player in Cavaliers history…only Rick Roberson posted a higher rebound total over a calendar month, taking down 205 rebounds through 16 games in December 1971…led the team in scoring four times, rebounds 23 times, assists four times, steals nine times and blocks eight times…scored 10-19 points 12 times, 20-29 five times and 30 or more points once… missed game on Nov. 7 with a sore right knee…missed games from Dec. 19-April 17 with a vastus medialis split/surgery…was placed on the Inactive List 57 times for the year. 2011-12: Played in 25 games (all starts)…averaged 10.8 points on .514 shooting, 11.5 rebounds (4.4 offensive), 1.7 assists and 1.4 steals in 31.4 minutes per game…set career highs in points, rebounds, assists, steals and double-doubles (14) at the time of his injury on Feb. 10…scored 13 points to go along with 12 rebounds (five offensive), five assists, four steals and two blocks in 34 minutes against the Timberwolves on Jan. 6, becoming the first Cavalier to record at least those numbers since LeBron James put up 31 points, 19 rebounds, eight assists, four steals and three blocks against Charlotte on Jan. 11, 2008…recorded a career-high 20 rebounds (also a career-high 10 offensive rebounds) to go along with a season-high 20 points on 10-17 (.588) and two assists in 41 minutes against Boston on Jan. 31, becoming the first Cavalier to record at least 20 points and 20 rebounds in a game since Carlos Boozer on March 30, 2004 when he had 23 points and 20 rebounds versus the Dallas Mavericks and the first Cav to record at least 20 points and 20 rebounds with 10 offensive rebounds in a game since Kenny Carr had 27 points and 20 rebounds (11 offensive rebounds) against the New York Knicks on February 12, 1981…recorded a double-double with 17 points on 8-13 (.615) shooting and 17 rebounds in 33 minutes versus Dallas on Feb. 4…led the team in scoring once, rebounds 21 times, steals seven times and blocks nine times…scored 10-19 points 16 times and 20 or more points once…missed games from Feb. 11-April 26 with a right wrist fracture (non-displaced)…was DND 13 times and NWT once on the season…was placed on the Inactive List 24 times for the year. 2001-02: Played in two games for F.C. Barcelona and in nine games in the Euroleague…named the MVP of the Brazilian league following the 2001 season in which he averaged 17.7 points, 9.7 rebounds and 3.0 blocks per game. Selected by the Orlando Magic in the second round (30th overall pick) of the 2004 NBA Draft. Acquired in a trade along with Drew Gooden and Steven Hunter on July 23, 2004 from the Orlando Magic in exchange for Tony Battie and two future second round picks. PERSONAL: Is a member of the Brazilian National Team and a former member of Brazil’s Junior National Team...is the younger brother of Sandro Varejao, who played basketball in the Big East Conference at West Virginia...played for F.C. Barcelona overseas before playing in the NBA.